Most rumors say that this year’s iPhone, the iPhone 8, iPhone X, iPhone Pro or iPhone 10, will come with three different screen sizes. The normal 4.7-inch and 5.5-inch will have LCD IPS displays, and the new 5.8-inch will have an OLED display with virtual buttons as a row at the bottom (think TouchBar…). 5.8 inches is now the widely agreed upon screen size for Apple's first iPhone with an OLED display, but there is likely a reasonable explanation as to why Nikkei and two other reports suggested the model would have a 5-inch display. Namely, KGI Securities analyst Ming-Chi Kuo said while the so-called "iPhone 8" will indeed have a 5.8-inch display, the primary area will actually be 5.15 inches, while the rest of the space will be reserved for a wide row of virtual buttons. Kuo also said the device's physical dimensions will likely be similar to a 4.7-inch iPhone. Given the size variation between the OLED panel, display area, and physical dimensions rumored, it remains unclear if Apple will officially categorize the "iPhone 8" as 5.1 inches, 5.2 inches, 5.8 inches, or a different size. So that means that the 5.8-inch version won’t have a larger display than the 5.5-inch iPhone 7 Plus. And it will also have a physical size more of the 4.7-inch iPhone. 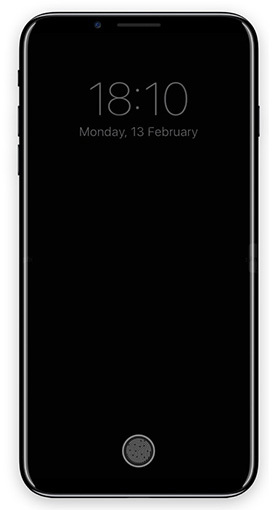 At first, I was glad to see that Apple would release a larger phone, but now when the rumors say that the bottom of the display will have some kind of TouchBar, then it’s a huge failure to me. Totally uninteresting. I want larger displays because I use my phones as pocket computers. So this rumored 5.8-inch phone can’t compete with the coming Samsung Galaxy S8 and Galaxy S8+ in my view.